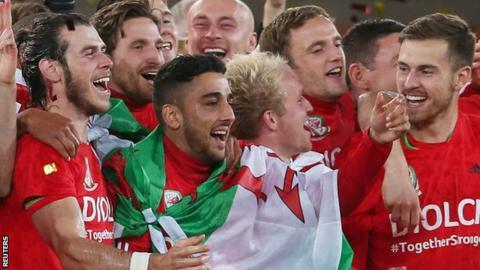 Wales and Swansea defender Neil Taylor has been named player of the year at the Asian Football Awards at Wembley. The awards, being held for the third time, recognise the achievements of British Asians in English football. Welsh-born Taylor, 26, who has an English father and Indian mother, helped his country reach Euro 2016. Aston Villa's 17-year-old defender Easah Suliman, who is of Pakistani heritage and captained England Under-17s, won the young player award. Kidderminster Harriers striker Gurjit Singh, 24, is of Indian heritage and won the non-league player gong. The Asian Football Awards have previously taken place in 2012 and 2013 and will now aim to become a biennial event. The organiser of the awards, Baljit Rihal, also hopes to raise awareness at the lack of professional players predominantly from a south Asian background. In the 2011 census, those from an Indian, Pakistani and Bangladeshi origin made up 5.3% of a 56,075,912 population in England and Wales. However, there are only seven players in England's top four divisions with a professional contract. Taylor is the most high profile, while Wolves centre-back Danny Batth and Mansfield left-back Malvind Benning are the only others from the group who play regular first-team football.